Cybersolv® 141-R is a precision cleaner blend of organic solvents that is safe and ready to use for bench-top electronics cleaning. Cybersolv 141-R is effective on a wide variety of soils typically found in electronic assembly and maintenance cleaning applications. Cybersolv 141-R is a non-flammable solvent-based benchtop cleaning fluid designed to remove rosin, resin, and synthetic polymeric flux residues from electronic circuitry. The mixture of solvents that make up this cleaning fluid are based on the ability to dissolve rosin and low residue flux residues, vapor pressure, stability, and low toxicity. Cybersolv 141-R dissolves the contaminant and then readily evaporates after the cleaning application. Cybersolv 141-R is designed for bench-top cleaning needs. The product is excellent for spot cleaning and is commonly used to clean solder joints following hand soldering. Cybersolv 141-R has a very low surface tension and can be used to clean narrow traces and under some component gaps. The product is ideally suited for cleaning through-hole and SMT electronic assemblies, connectors, cables and hybrid circuits. The solvents used in Cybersolv 141-R are non-polar but possess properties for dissolving flux residues. The solvent composition creates a weak intermolecular force arising from polarized multi-poles present in the solvent blend. These forces induce a dipole-dipole intermolecular interaction that facilitates the rapid dissolution of rosin and resin structures. The solvents used in Cybersolv 141-R contain mild and low toxicity fluorinated hydrocarbons in combination with organic covalently bonded chlorinated compounds. The solvents that make up Cybersolv 141-R are low in toxicity, low in global warming potential and non-ozone depleting. It contains no CFCs or HAPs. CYBERSOLV® C8508 is the latest generation spray cleaner for reflow ovens and general equipment maintenance cleaning. C8508 has been tested on the toughest baked on flux residues with great success and has proven effective on the latest lead free flux. Cybersolv C8508 is a non-flammable solvent maintenance cleaning fluid designed to remove flux residues from reflow oven surfaces, wave soldering fingers and pallets. Metal spring loaded fingers are used to hold and track printed circuit boards over a solder bath during the wave soldering process. Prior to soldering, liquid fluxes are applied to the bottom side of the circuit board using foaming and spray application methods. Overspray from the liquid fluxes adheres to wave fingers and pallets. Over time, the over spray flux must be cleaned. Cybersolv C8508 solvency make-up is engineered with a mixture of oxygenated solvents and water. The solvents are specifically selected based on their affinity for rosin, no-clean and water soluble wave solder flux residues. Wave soldering machines are equipped with a fluid chamber and brushes to removed flux residues following the soldering process. C8508 is used full strength. The composition dissolves the flux residues and dries evenly without the need for a rinse. Cybersolv C8508 is also effective at cleaning wave soldering pallets. The product is designed to be full strength in immersion systems using spray-under-immersion or ultrasonic agitation. The product is effective at ambient temperatures. If the residues are burnt or charred, heating the solution to 50-60°C improves cleaning performance. Following the cleaning step, the pallets should be rinsed with DI water and dried. Cybersolv® C8544 is a solvent cleaner and stripper designed to be used in immersion and manual cleaning applications. Easy to use, C8544 is applied as received and heated in a well-ventilated tank. Cybersolv C8544 removes oils and grease from industrial, electronics and optic components. It has also proven effective as a powder coat paint stripper and is an environmentally friendly replacement for traditionally hazardous strippers. Cybersolv® C8882 is a fast-acting stencil cleaning solvent designed for the understencil wipe process. Cybersolv C8882 instantly dissolves all flux types within the solder paste, including water soluble, rosin and low residue no-clean fluxes. Cybersolv C8882 is a solvent-based stencil cleaning fluid specifically designed to clean wet solder paste, SMT adhesive and flux residue from stencils (conventional and plastic pump), mis-printed PCBs, wave soldering pallets and tools, fixtures and squeegees. Cybersolv C8882 dissolves the flux vehicle, which allows solder balls to release from the stencil during the stencil printer wipe sequence. Cybersolv C8882 has a flash point over 60°C and evaporates cleanly from the stencil. Understencil Wipe Cleaning – Solvates the flux resin compositions within uncured solder pastes. Effectively cleans and removes solder paste that has a tendency to stick to the aperture walls and bottom of the stencil. Following the wipe process, a dry wipe and vacuum process rapidly dry the stencil following the cleaning process. Hand-wipe, Immersion Stencil and Pallet Cleaning – The selection of solvents used in Cybersolv C8882 effectively remove polar and non-polar soils. Cybersolv C8882 can be used to hand-wipe a stencil following the printing process. Solvent Stencil Cleaning Spray Systems – Cybersolv C8882 is designed to run in solvent spray-under- immersion and spray-in-air cleaning machines that were commonly designed to clean with IPA. Cybersolv C8882 effectively washes and rinses the stencil. For optimal stencil cleaning performance, Cybersolv C8882 should be processed “as is” at 100% concentration at ambient temperatures. 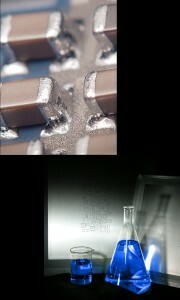 Cybersolv C8882 wets and rapidly dissolves the flux that holds the solder spheres into a paste. Upon dissolution of the flux, solder balls release from the apertures and drop to the bottom of the cleaning tank. In well-designed stencil cleaning equipment, the solder balls are caught in recirculation filters, greatly extending bath life. Cybersolv C8882 has no ozone depleting or global warming potential and is non-hazardous. Furthermore, this product does not contain substances prohibited by EU Directive 2011/65/EU, Restriction of Hazardous Substance Directive (RoHS). Please reference the Cybersolv C8882 Safety Data Sheet for other safety and/or performance considerations.